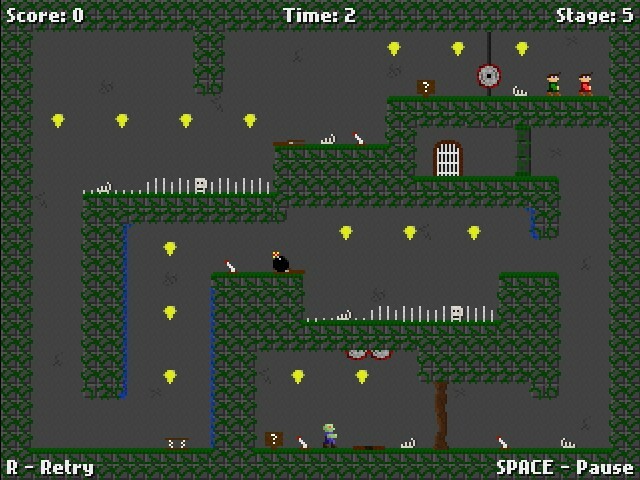 Zombie Crypt 3 is a puzzle platformer game with a very old school 8/16 bit art style. You control 2 characters and work your way through the levels that can be jungle’s, desert’s and a volcano, I’m not sure if it’s intended to be a 2 player game or the whole point of the game is that it’s difficult because you have to control 2 characters at the same time. The game is based around the mechanic that you can’t complete a level with 1 character so there are pressure pads to step on so 1 character can get through a door or to activate a trampoline and levers to press to help the other character. To control the characters you use ‘WASD’ and the arrow keys, when you interact with lets say a lever you press ‘S’ or the down arrow key and they are all you use. You can see the full level as soon as you start so you can work out what you need to do to complete it by getting to the exit door which is the aim but it’s also about score. You get score by completing the stage in lowest time possible, collecting coins, not dying and killing enemies and then at the end of each level you get a points score and a skull score out of 3. The main categories Zombie Crypt 3 falls into are Illinx and Mimicry, it could also possibly fall into Agon as well. It’s in Illinx because of the disorientating nature of having to control 2 characters at once, this is especially difficult if you are trying to gain a good score so need a very quick time. It’s in Mimicry because as in most game you are controlling a character, in this case 2 in the form of Gerald and Ronald who explore zombie crypts. The reason I think it could go into Agon as well because you get a score at the end of the levels and you can submit a score to compete against people. I didn’t reach a state of flow whilst playing because I found it difficult with having to control both the characters simultaneously it’s very disorientating which I suspect is what the game is trying to be. As for what element of the flow diagram I did achieve I would say it was control, I always felt good enough to complete the levels but this may of changed if I got further into the game and closer to the end. Zombie shooter is a stand still shooting game where you have to kill all the zombies on the level without running out of bullets and the less bullets you use the better score you get. The controls are very simple, just move the mouse cursor to move your gun and then left click to shoot, the main challenge in the game is that you have limited ammo to kill these zombies and some are hard to hit being behind objects like crates or walls. Your bullets can ricochet off the walls and the side of the screen which is a cool mechanic which adds to the game because it allows it to put zombies in more complex places without making them impossible to hit. It takes a lot of inspiration from Angry Birds the way you have a certain amount of chances to destroy your targets. As for Roger Caillois’s game categories it goes into, they are Agon and Mimicry. It goes into Agon because you are competing to get score for each level and to try and complete the game, you could also be competing against friends for bragging rights if you can complete a level they can’t. 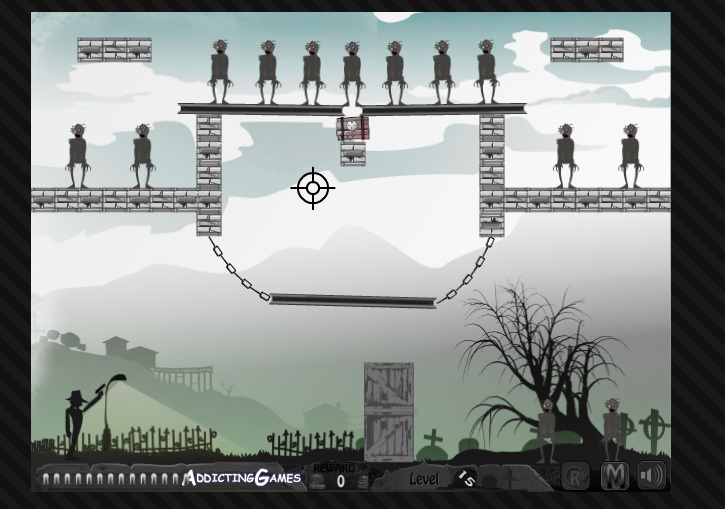 It also goes into Mimicry because you are playing as this shadowy figure who kills zombies in elaborate ways. I didn’t reach a state of flow whilst playing because personally this genre of game doesn’t induce flow for me but I’m sure it will for many other people as Angry Birds is very popular and it’s a very similar game. I would say I was in a state of relaxation as I wasn’t struggling to fly through the levels of the game and was just laid back whilst I was playing, wasn’t a boring game by any means though.